I read the New York Times with my morning coffee and came across an interesting editorial, “Advances on the AIDS Front”. 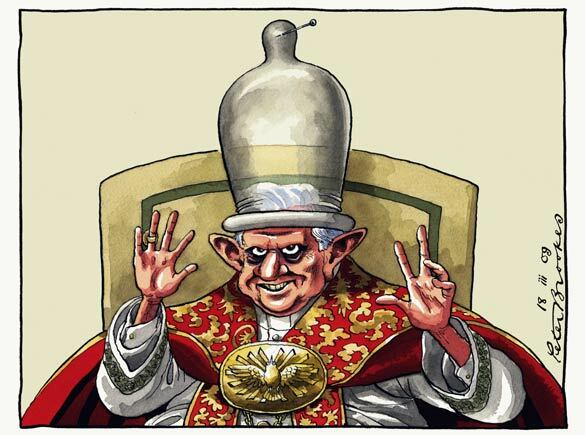 Pope Benedict XVI expressed the view that condoms could be used to prevent disease transmission. That could make it easier for ecclesiastical workers and AIDS prevention programs to promote their use. The Pope should be applauded for leaving the fifteenth century and all positive steps are welcome. But isn’t it ironic that the Vatican finally stopped its blind attacks on condoms at the very moment there was a pill to potentially limit the spread of the disease? My point is that the juxtaposition of these new discoveries and Rome finally seeing the light highlights how appallingly late they are to the game. I first heard of AIDS when I was eleven or twelve. I am now 40-years old and millions of people are now dead — and the Pope has finally come around to agree that male prostitutes should wear condoms. I bristle when I think of the countless lives that could have been spared had the Vatican spoken while I was in Middle School instead of middle age. If Rome had really been pro-life than thousands, maybe even hundreds of thousands, of human beings — men, women, children and even babies — would have survived. Pope John Paul II and Pope Benedict XVI had the power to raise awareness about condoms. Their stubborn prudishness led to piles of dead bodies — Holocaust size in scale — that could have been prevented. When I think about what could have been accomplished with an enlightened Vatican it breaks my heart. But for some pathological reason, pontiffs always seem compelled to reject science and finally come around after a body count. Sadly, the Vatican’s two responses to HIV/AIDS prevention efforts have been sleep walking or walking off a cliff. History will judge these actions quite harshly and severely tarnish the church’s image. There is no rule in the Bible that claims you must fight to undermine every scientific advance since the Enlightenment. History shows that you will eventually embrace the truth anyway, so why not sooner than later? In the future, why not try the wise — instead of the ignorant, reactionary — course of action — particualrly when lives are at stake?